I absolutely love this gyro in my G500! It's kind of like a cross between a Vbar and a BeastX. Great feel in the air, perfect lock, but also very simple to set up with my MZ-24. I haven't had a ton of time with it yet so I can't quite give it a 5 star rating but it's extremely close right out of the box. I've used Spartan, Ikon, Skookum, Vbar, BeastX, Bavarian Demon, Robird, end a few other lesser name brands and I'd say this one is almost tied with the BD (which is currently my favorite). Installed in my new Goblin 570. I have been a Graupner fan for 3 years now. I have 3 of these in aircraft, two small electrics and a large warbird, all with the gain adjustable at the transmitter. The small planes fly very smooth in the wind, much like a larger aircraft, however there is little effect on the sticks by the gyro unlike some gyros that try to undo the stick commands. First time purchase of telemetry equipment, but I just love these receivers and especially the MZ-24 Pro. I just purchased three weeks ago and I finally finished programming three of my planes. Going into retirement, so I thought I would splurge on the last radio with some of the best products on the market. I was stationed in Germany when I first got into this hobby and purchased Graupner products before so my confidence has always been high, but this is one of the best. It took some reading, Utube research and one call to Tech support at Graupner USA and I was up and flying. When updating the V2 firmware, make sure your ready to click install with the proper update then unplug the power to the receiver, click install then as it sits there looking like its down loading, power up the receiver and it down loads like a charm. If you miss that step, the software just waits. That is the call I made to Tech support. Some where I missed it. I'm in business now. Love it! Purchased this receiver in December 2017 . Besides the operator errors on my part and being the first Flight Controller for Synergy N5C FBL unit , it is easy to program and the default settings are rock solid for getting the helicopter off the ground! 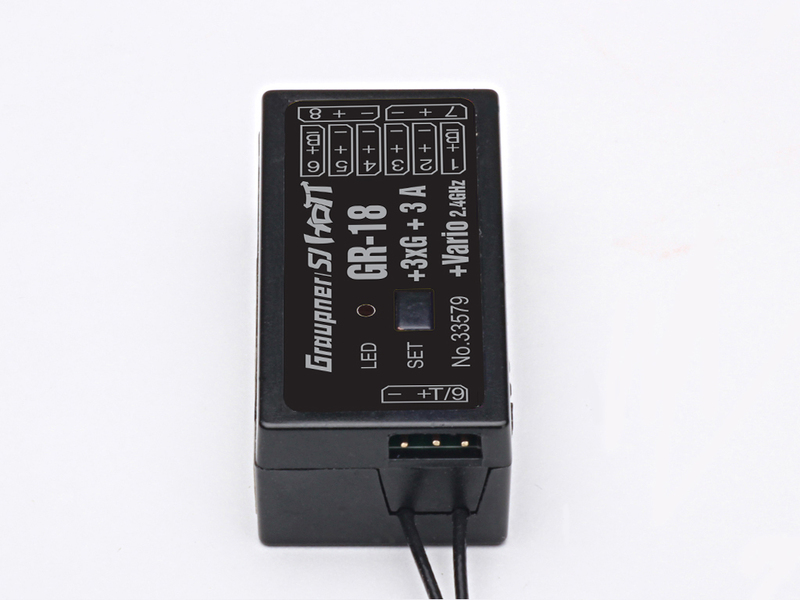 Any trimming and adjustments can be done via Graupner transmitter which means no Laptop to take to the field or reconnect to make adjustments at the field. I used regular two side tape for mounting horizontally, it is not picking up any unwanted vibrations that are typical for running a nitro engine . There is also two other receivers two use if needed for Helicopter receiver, the GR 24 and the Falcon. Great tech support also! 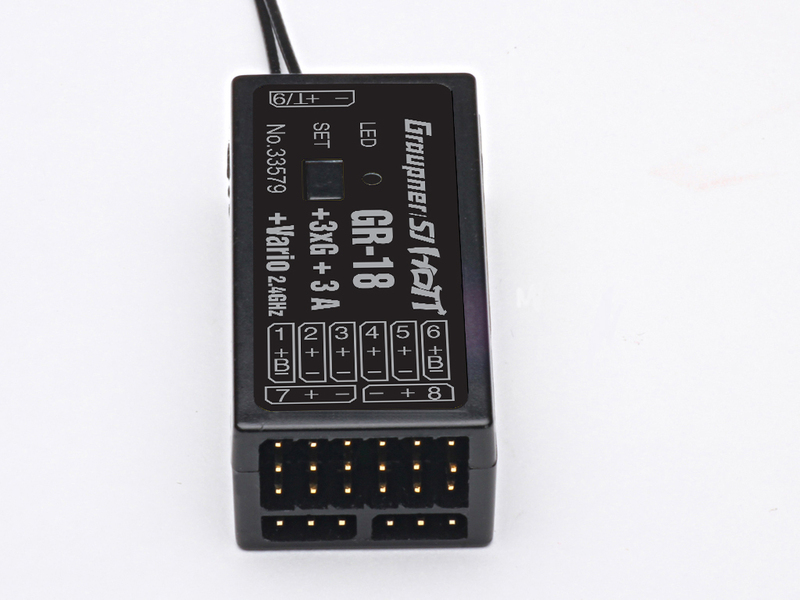 You will be doing some Happy Flying with Graupner. A: Yes you should be able to do that. Please note that in some cases you will have to use the built in mixers of the GR-18 to resolve specific wing configurations. Q: Does this unit have a rescue function when being used as a flybarless unit? A: There is currently no rescue function for this flight controller. Q: Can i download the software of the GR18C to this receiver? A: If you want to use the receiver for multirotor purposes then you will need to download the firmware for this model from the download page. The GR18C P/N S1019 is not compatible with this P/N.